But with first pitch for the spring training game in question at 1 PM, there was still time to see some radio and TV before the game, right? Which is how we find ourselves at the oldest broadcast facility in town. 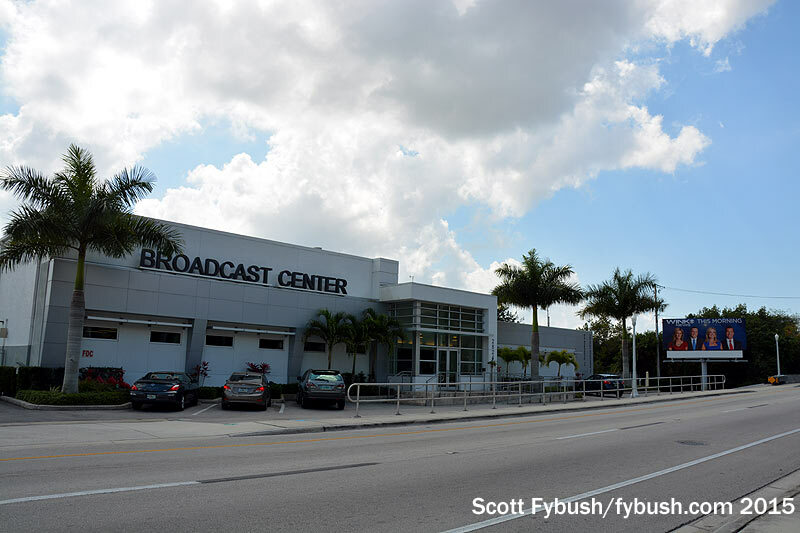 Fort Myers Broadcasting put WFTM (1210, later 1240) on the air in 1939, soon changing calls to the memorable WINK and adding the region’s first TV station, WINK-TV (Channel 11), in 1954. All those years later, the building that WINK-TV built at 2824 Palm Beach Blvd. back in the 1950s is still here. 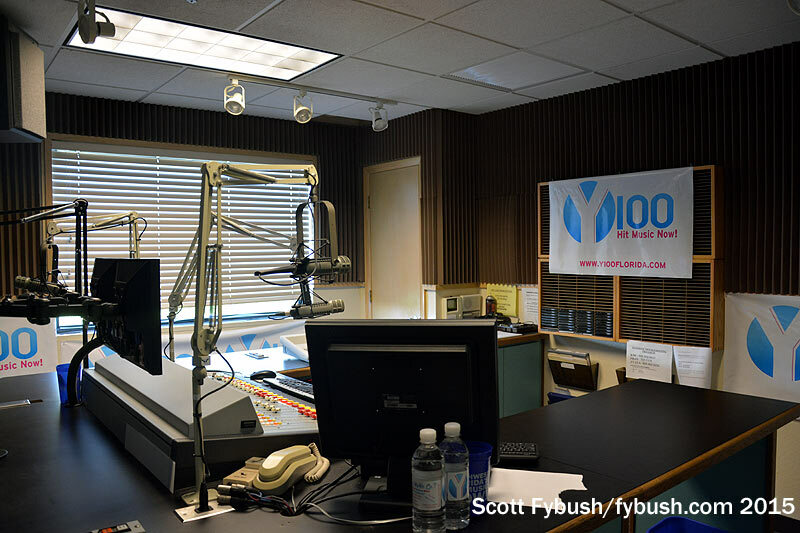 It’s been heavily expanded and renovated over the years, and today it houses two clusters’ worth of radio and TV stations. 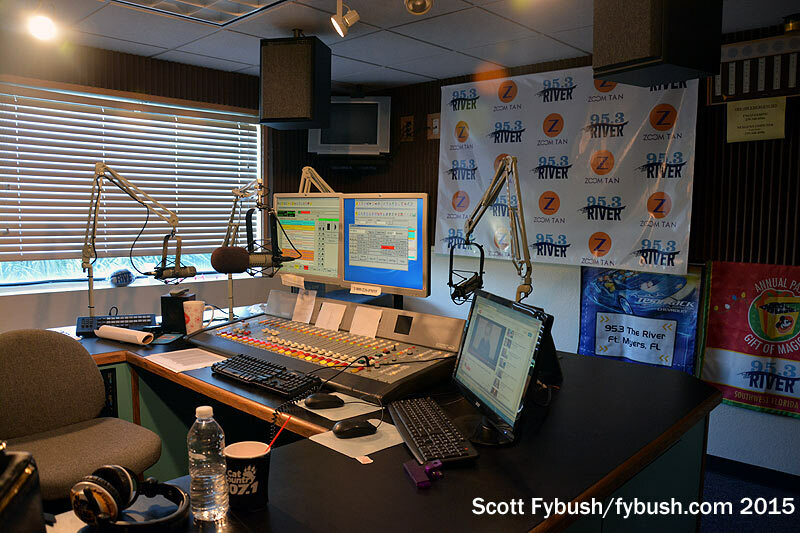 Fort Myers Broadcasting owns CBS affiliate WINK-TV (Channel 11), hot AC “More” WINK-FM (96.9), and Spanish-language signals WJUA (1200 Pine Island Center)/WNPL (1460 Golden Gate) and WTLQ (97.7 Pine Island Center). 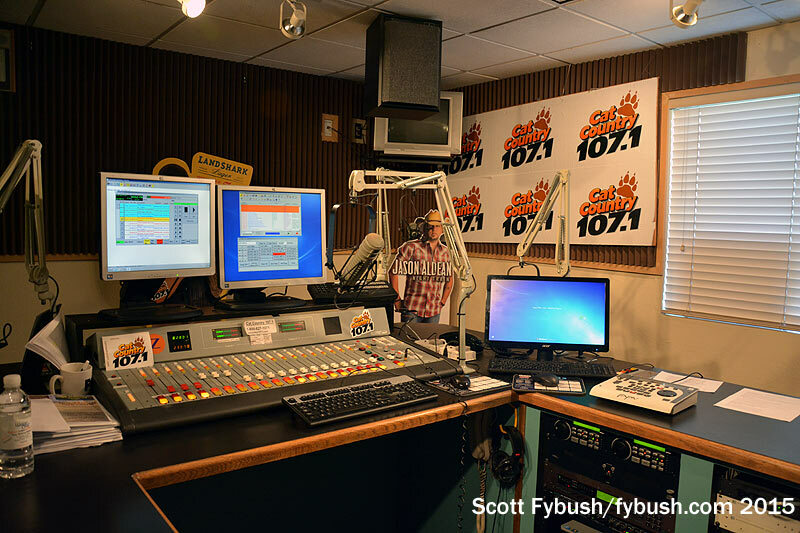 Sister company Sun Broadcasting owns CW affiliate WXCW (Channel 46), sports WFWN (1240 Ft. Myers)/WNOG (1270 Naples), talk WFSX (92.5 Estero), modern rock “X” WXNX (93.7 Sanibel) and classic rock WARO (94.5 Naples). 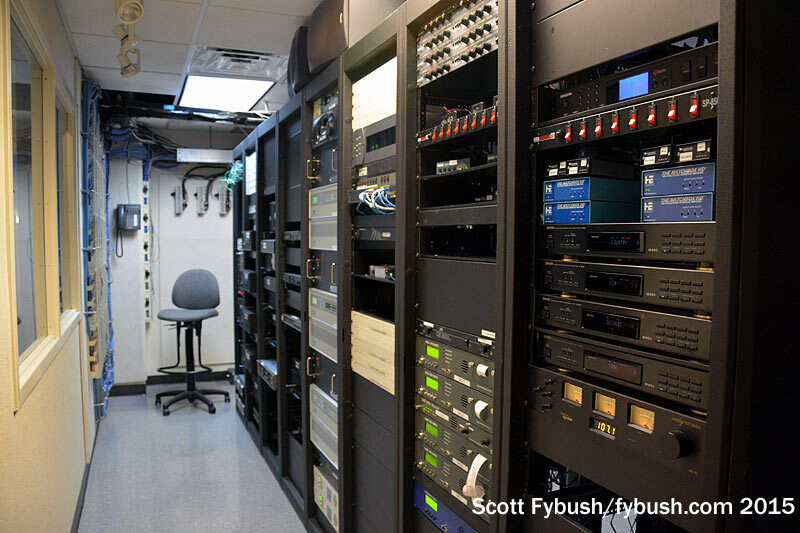 The radio studios are all in an L-shaped cluster located roughly behind the lobby, along a hallway that leads back to a spacious newsroom that sits on the first floor of the two-story rear part of the building. WINK-TV does a lot of news every day from here, both at the usual times on WINK-TV itself and at less-usual times (7-9 AM, 6:30 PM, 10 PM) on WXCW, and so it’s somewhat rare that we find the TV studio not in use. 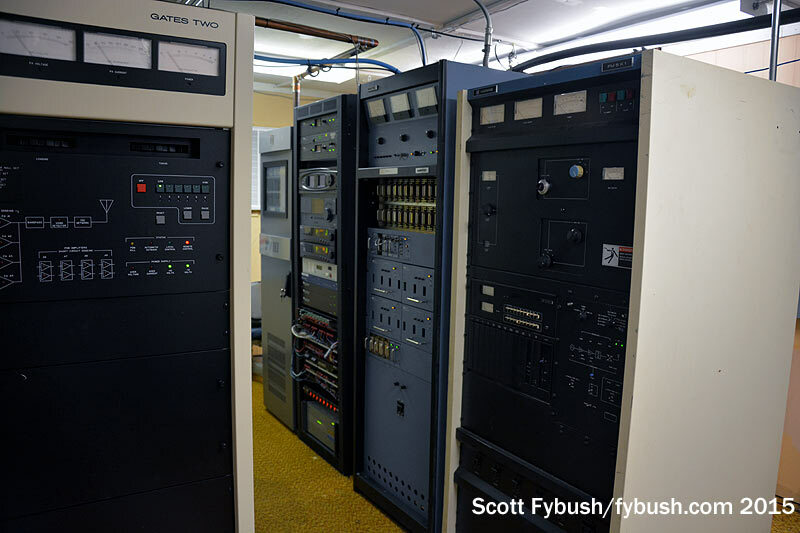 Behind the newsroom, ongoing renovations have turned the TV control room areas into a modern HD facility; it would be fascinating indeed to see what all this looked like back in 1954, wouldn’t it? After the WINK tour, it’s off to “JetBlue Park at Fenway South” to spend a lazy afternoon watching a team that appears, early on, to have so much promise (sigh…), followed by a return to the more developed parts of Fort Myers and an appointment along Metro Parkway at the studios of the iHeart Radio cluster serving the market. There are four FMs in this two-story facility, with sales and business offices and the rack room downstairs in a big atrium area anchored at one end by the “Zoom Tan Stage” for live performances. 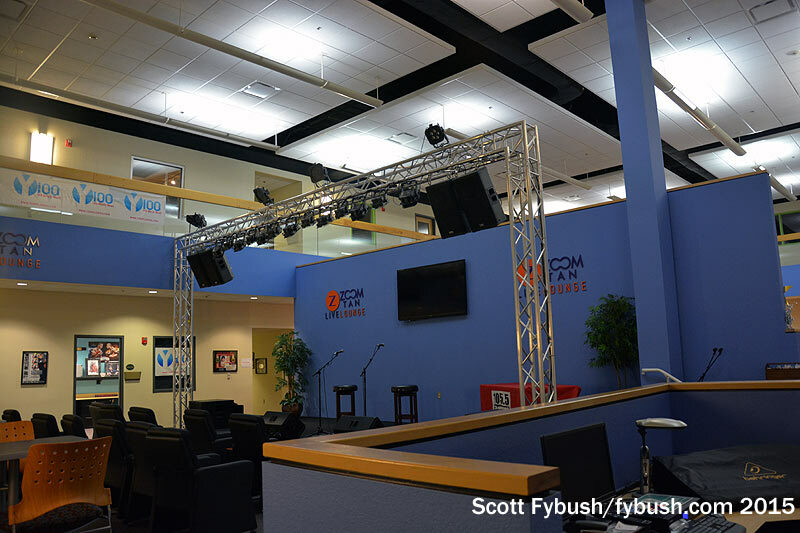 The four FM studios are all upstairs overlooking the atrium: rhythmic top-40 WBTT (105.5 the Beat), “Cat” country WCKT (107.1), classic hits “River” WOLZ (95.3) and top-40 “Y100” WZJZ (100.1). It’s pretty late on a Friday afternoon when we get there, so it’s not completely surprising the building is fairly empty – but it’s true, too, that as a smaller iHeart market most of the talent heard here is either syndicated nationally or tracked via Premium Choice from elsewhere. 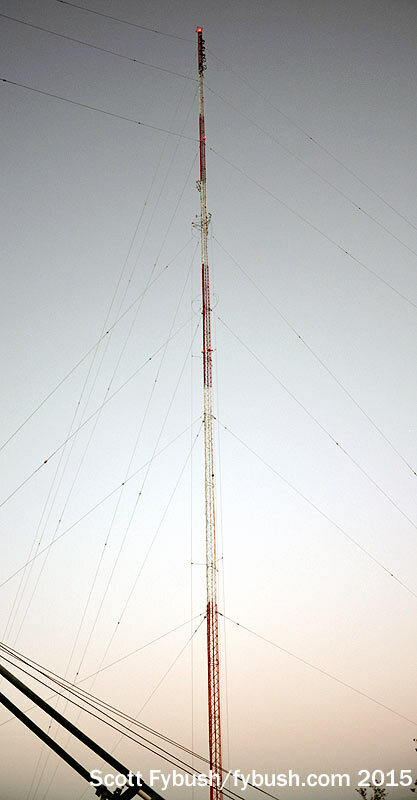 There’s still some daylight to be had, even though the switch to DST won’t happen for a few more days, and so when the iHeart engineers invite us to see some towers we gladly follow them northward up through downtown Fort Myers and out to the tower farm way northeast of town that’s mostly home to the market’s big TV stations. 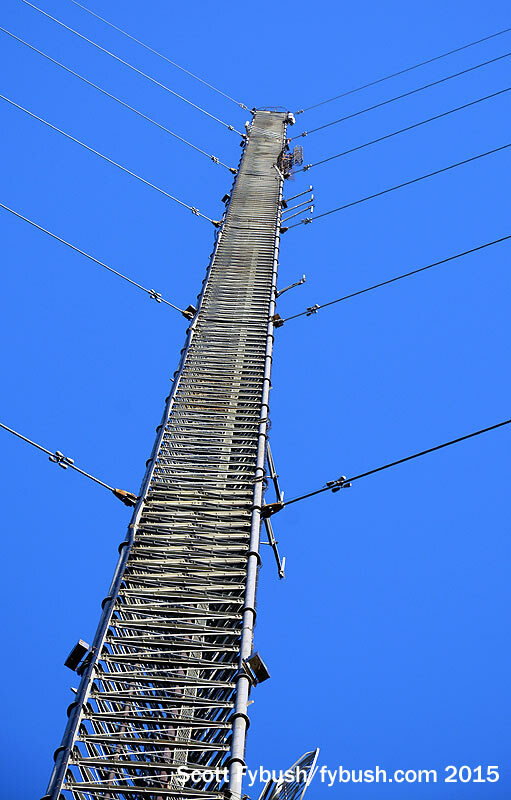 But among those towers along State Route 31 (including that of WINK-TV/WINK-FM), there’s an American Tower site west of 31 along Horseshoe Road (this is horsey country) that’s home to one of the iHeart FMs. And with just a little bit of time still remaining before sunset, we head north and west for one last site in the dusk. You don’t have to go too far north from Fort Myers to wander into a somewhat separate broadcast market: just past Fort Myers/North Fort Myers and adjacent Cape Coral, I-75 angles up into the Port Charlotte-Punta Gorda area, which in turn shades almost imperceptibly into the Venice/Sarasota/Bradenton area. 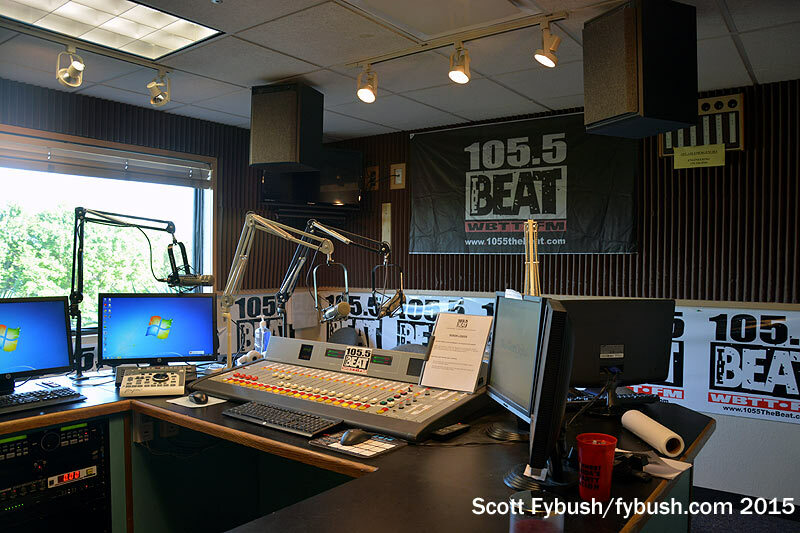 Through several acquisitions over the years, iHeart ended up with two AMs and two FMs up here (along with WZJZ, which has a signal big enough to have moved south into the Fort Myers market). The older pair of stations in the market are also the original occupants here. 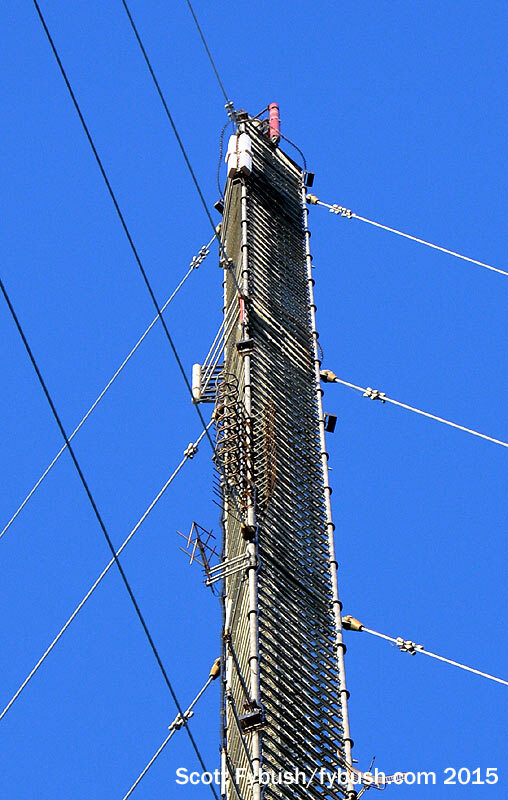 WCCF (1580 Punta Gorda) dates back to 1961, while what’s now WIKX (92.9 Charlotte Harbor) signed on in 1970. 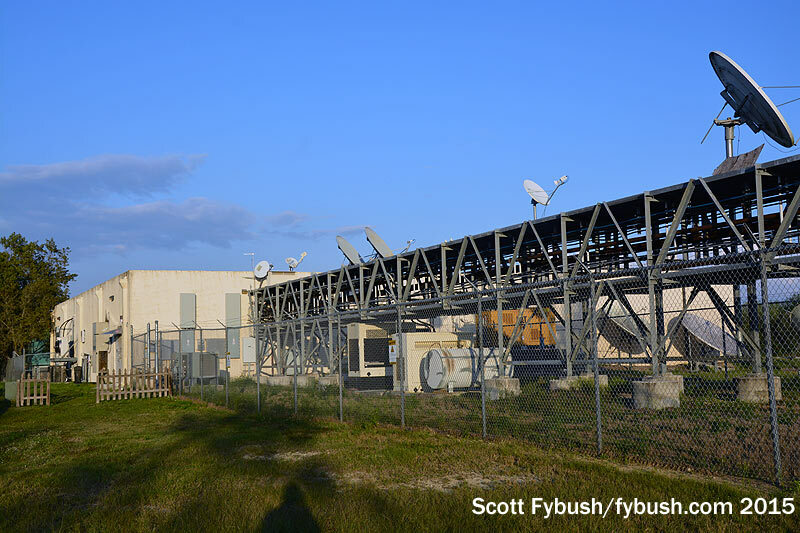 “Kix” has only an auxiliary presence on this tower now; its main 100 kW C1 facility is now west of here at Rotondo, almost into the Gulf of Mexico, where it has a signal that reaches from south of Fort Myers to north of Sarasota. Two more stations joined the family here at 4810 Deltona Drive in Punta Gorda later on. Hal Kneller, known to many in the broadcasting community for his long career in equipment sales, put WKII on the air in the mid-1980s on 1090 from Punta Gorda. It later moved to 1070 in Solana before relocating from a site east of US 41 to a diplex with WCCF here. 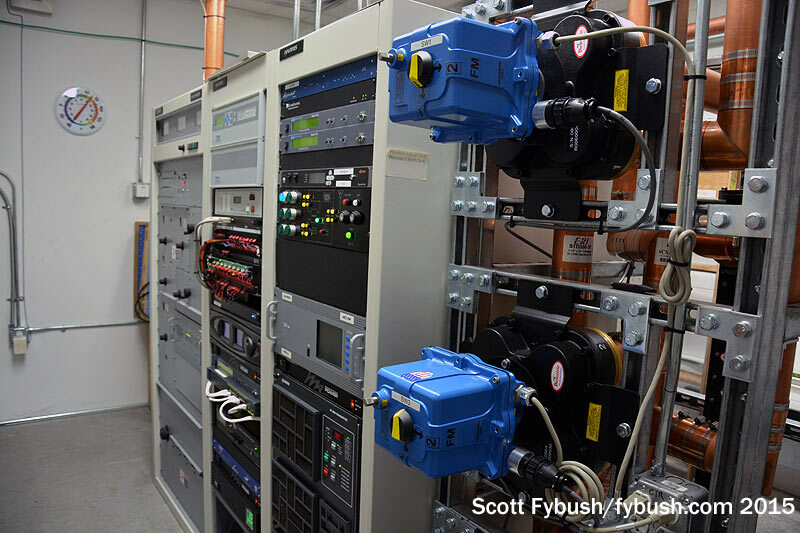 And the final arrival is what’s now WCVU (104.9 Solana), which started out as a 3 kW class A on 105.3 before moving to its present 6 kW status on 104.9. 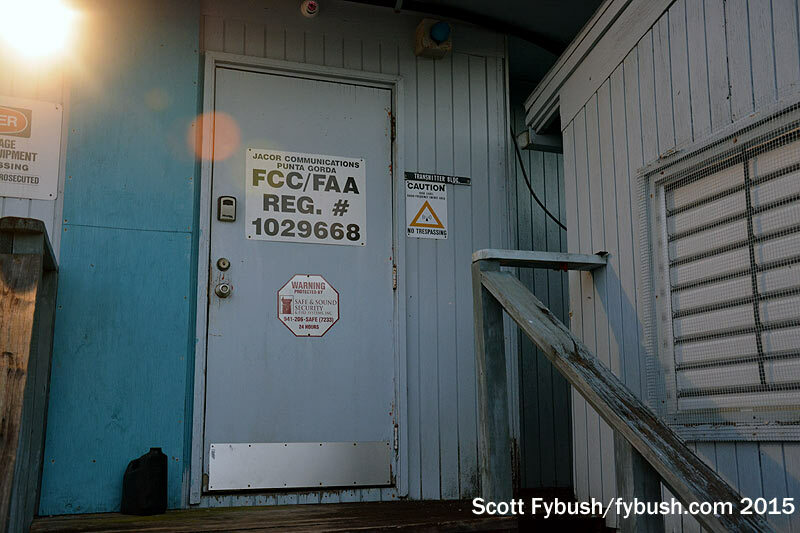 Aside from a handful of religious signals, that’s basically the entire radio dial in Charlotte County and vicinity – and so we’re off to the wilds of central Florida to see some very, very big shortwave. Check back next week! Thanks to iHeart’s Paul Wolf for the tours! And don’t miss a big batch of southwest Florida IDs next Wednesday, over at our sister site, TopHour.com! I first became acquainted with the WINK calls while vacationing with my family at Fort Myers Beach in December, 1982. Along with State and local police, Customs and ATF agents, a “Square Grouper” round up was occurring on the beach in front of our rental. The Square Groupers being rounded up were bales of marijuana, abandoned by a drug runner intercepted by the Coast Guard. WINK-TV sent a reporter and a cameraman to cover this local circus.Their high tech vehicle at the time was a then new Chevrolet Citation. Somewhere I have grainy pictures of the reporter at the time, his vehicle and the circus that was taking place on the beach, as some folks were cashing in on what to them was a bounty, and the Law Enforcement folks were seeing to it that their glee was short lived.